Get multiple I/O channels without taking up a lot of space. 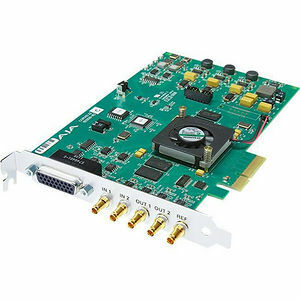 Corvid 22 provides high performance, dual channel video and embedded 24-bit audio I/O in a single PCIe card. Two completely independent channels handle resolutions up to 2K and high frame rate 3G as well. With separate LTC and RS-422 machine control per channel and support for multiple operating systems, Corvid 22 gives you all the performance and capabilities you need. 2 Mixer/Keyer widgets. This allows output of two simultaneous video/key pairs over 3G. It also allows for up to two simultaneous downstream keyers.